St Giles’ Church building dates from about 1350, although a Norman stone from a capital was found in the churchyard. 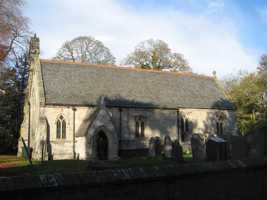 It is built from limestone rubble and consists of chancel, nave, north aisle, south porch and bell turret on the west gable. The bell is dated 1660. In 1848 the north aisle was added according to designs by G G Place and the church was reseated and refloored. George Gilbert Scott restored the nave and chancel in 1862. There was a boarded partition above the screen (and never a chancel arch). A similar sort of screen can be seen in Wenhaston Church, Suffolk, and also at Bunny and Wysall. In the outer south wall is a fine 14th century recess which contains the headless, worn effigy of a priest. On either side of it are good two-light, square-headed windows. Two stained glass windows were designed by Burleson & Grylls. There is a piscina and a font with an ancient bowl on a modern pedestal. The poppy-head bench ends were carved by the Rev C S Millard following the pattern of the six 13th century originals. There are two distinctive crosses on one of the quoins of the south nave wall, which may be pre-Conquest in form.